URGENTLY REQUIRED FOR LONDON ACADEMY – QATAR. A LONDON ACADEMY IN QATAR URGENTLY requires female teachers. Candidates who are seeking for latest teaching Jobs openings in Gulf countries can also check the details of latest teaching jobs in UAE Indian schools that we have recently posted in this site. Here we are updating the Complete details of the Job Interview like Job Category, Job Description, required Educational criteria, required Experience if mandatory etc.., The LONDON ACADEMY in QATAR is Conducting conducting interviews for 5 various teaching Jobs. Eligible and Interested Candidates can apply for this Teaching Job Interview. . WALK IN INTERVIEW IN HYDERABAD ON 23th April 2017 i.e on SUNDAY. Mathematics Teacher 5 – vacancies are available, Salary Offered up to (in QATAR Riyal) – 3000 -4000 QR + Incentives, required Qualification is candidates Should be PG / B.Ed with 3 Years Exp. in CBSE Syllabus, Gulf Exp will be Preferred. Chemistry Teacher 5 vacancies are available Salary offered Up to 3000-4000 QR + Incentives, required Qualification is candidates Should be PG / B.Ed with 3 Years Exp. in CBSE Syllabus, Gulf Exp will be Preferred. Below you have the complete details of the Job Interview. URGENTLY REQUIRED FOR LONDON ACADEMY – QATAR. A LONDON ACADEMY IN QATAR URGENTLY requires female teachers. WALK IN INTERVIEW IN HYDERABAD ON 23 th April 2017 i.e on SUNDAY. Mathematics Teacher 5 – vacancies are available, Salary Offered up to (in QATAR Riyal) – 3000 -4000 QR + Incentives, required Qualification is candidates Should be PG / B.Ed with 3 Years Exp. in CBSE Syllabus, Gulf Exp will be Preferred. Chemistry Teacher 5 vacancies are available Salary offered Up to 3000-4000 QR + Incentives, required Qualification is candidates Should be PG / B.Ed with 3 Years Exp. in CBSE Syllabus, Gulf Exp will be Preferred. Aspirants who are interested can also check the details of primary teaching jobs in Dubai that have been recently posted in this site. Physics Teacher 5 vacancies are available Salary offered Up to 3000-4000 QR + Incentives, required Qualification is candidates Should be PG / B.Ed with 3 Years Exp. in CBSE Syllabus, Gulf Exp will be Preferred. Biology Teacher 4 vacancies are available Salary offered Up to 3000-4000 QR + Incentives, required Qualification is candidates Should be PG / B.Ed with 3 Years Exp. in CBSE Syllabus, Gulf Exp will be Preferred. English Teacher 4 vacancies are available Salary offered Up to 3000-4000 QR + Incentives, required Qualification is candidates Should be PG / B.Ed with 3 Years Exp. in CBSE Syllabus, Gulf Exp will be Preferred. Benefits – 8 hrs Duty + Free Accommodation + Medical + Transportation + All Other Benefits as per QATAR labour law will be provided for the Candidates who are selected in the Job interview. Contact Ms. Waseema: 970465049 / 040-33151524. Applicants who are Interested to apply can send their CV with Post Applying in Subject to [email protected] / [email protected] Interview Venue C/o Certified Organization Hyderabad. TRAVEL POINT HR SOLUTIONS INDIA. # Ground & 1st Floor, Gupta Estate, Opp. Babu khan Estate, Beside Parisrama Bhavan, SBI Bank, Basheerbagh X Road, Hyderabad. For more latest Gulf Job Updates visit the site and check the recently posted latest Job updates in this Site. 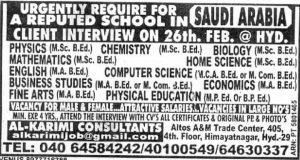 Teacher VACANCY teaching jobs in gulf: SAUDI ARABIA: Required Professor’s & Teacher’s For International School Position & Subjects (std, up to Grade xii), QUALIFICATION: ACCOUNTANCY (Male) M. Com, Accountancy, B. Ed, BIOLOGY (Male) M.sc, Biology, B.Ed. in Science, BUSINESS STUDIES (Male) MBA / B.Ed, CHEMISTRY (Male) M.sc. Chemistry, B. Ed in Science, COMPUTER SCIENCE (Male) MCA, B.Ed Science (Male & Female) MA, English. B.Ed. English, ECONOMICS (Male) MA, Economics, B.Ed. SUNDAY. ARTS (Male), FINE MA Fine Arts, B.Ed. OPEN HOME SCIENCE (Male & Female) M.SC. Home Science, B.Ed Science, MATHEMATICS (Male) M.sc Mathematics, B.Ed, Science. PHYSICS (Male) M.sc, Physics, B.Ed. in Science. PHYSICAL EDUCATION PT (Male & Female M.P.Ed). Free Recruitment, CLIENT INTERVIEW IN PROGRESS in person with 2 set of bio-data, original passport Qualification Box certificates & 2photos OVERSEAS CONSULTANTS. Shivai pura – 705 Ryh, Mato Andheri E.Mumbai. 59 Tel No: 02240159999. EMAIL: [email protected] Website: www.jivoxgroup.com. I’m Mohana Priya Elanchezhian from Chennai with three years of experience in teaching field at Murugappa polytechnic college, Chennai. I’m graduated from Vel Tech (2013. B. ECivil Engineering). I wish to continue my career in abroad. kindly guide me according to it.